I sometimes think of her and search her out in the depths of my closet, tucked away in a battered brown suitcase. 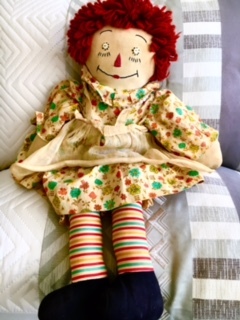 Raggedy Ann has been my constant companion throughout life for as long as I can remember. She is a connecting thread that weaves in and out of memory and experience. Her stout stuffed figure always came in handy for a good cry or a bout of nostalgia. She is the direct link to my childhood, the single object identified with my mother. I depended on her like a friend, and like a friend she was always there when I needed her. I received this precious gift from my mother when my memories were just beginning to form. 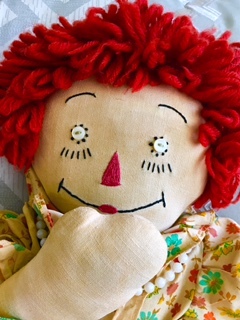 Raggedy Ann was handmade for me by a friend of the family, a talented seamstress who artfully sewed pale blue button eyes above the red triangle nose and embroidered just the right touch of warmth into the empathetic smile. A starched white apron covered the beige muslin dress which was sprinkled with tiny flowers of yellow, green and orange. The ruffle of knee-length bloomers was basted with herringbone stitches. The red and white striped stockings added a comical touch to her sensible black cotton shoes. 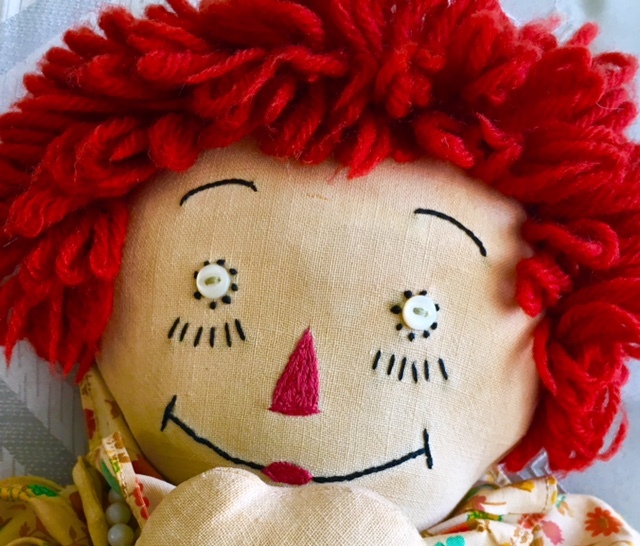 My Raggedy Ann proudly wore her famous red curls like a crown on her head. I often wished that her mitten shaped hands would magically sprout plump cotton-stuffed fingers in which I could interlock my own while we shared our most intimate secrets. She was special and I loved her. The loss of my mother to cancer when I was five years old deepened that longing for intimacy. Through most of my childhood years, I yearned to fill the emptiness that her death created. I never knew my mother well enough to miss her in a personal sense. She was merely and most importantly Mommy; the ever present source of comfort and secure base from which to explore the world. She had given me the gift of Raggedy Ann during a time of happiness and hope. There were no dark clouds to cast shadows across our lives. At the time, she couldn’t have understood the importance of her gift. That was to come later, after she was gone. With Raggedy Ann, I could pretend that I was still feeling that sense of daily continuity. That nothing bad had really happened. That life would continue to be safe, secure, and predictable. That my Mother’s love had not vanished in the dust of her ashes. Raggedy Ann would comfort me, until my mother returned. She never returned. Raggedy Ann, however, stayed on and on. Adorning my freshly made bed, plumped up comfortably against the pillows, she carried the burden of my tears and shared in the joy of my successes. She saw me through the hard times when the emptiness I felt seemed like a bottomless abyss; until slowly, painfully, I could finally face the truth and accept it. I still pull the old suitcase down from the closet shelf from time to time, to visit with my old friend. As I look at her now, she seems a bit faded and love worn. Her apron has yellowed and her muslin face has turned from white to dull gray, but she still radiates her own warmth, smiling in that knowing way of hers. She was always there to understand – just as I know my mother would have. My special friend has changed and so have I. Today, her dingy appearance shows signs of time and neglect. As she has faded, I have blossomed. But I keep in my heart the lessons she saw me through about love, pain, and hope. Over the years my need for her has lessened. I have learned to face my own problems and have found the nurturing comfort within myself that I always depended on her to give. Now I have enough love, not only for myself, but for others. The source of this love seems to come from a deeper connection than Raggedy Ann, or even myself. The real connecting thread that winds around my heart belongs to my mother. She has always been with me. She never really left. She has been propped up against my bed pillows watching my life through blue button eyes, waiting to make her home in my heart. But she didn’t have to wait, she was there all along. My mother’s gift to me was not a doll made of cloth, but her own special love . . . and now that love lives on in me. If this essay touched your heart please leave a comment. If you’d like to read more, sign up for my blog.